Any day that is associated with food, whether because restrictions are about to be imposed or restrictions are to be erased for one special day, by rights ought to have as many nicknames as it can bear. Bruegel’s masterwork, which dates from 1559, is huge, almost four feet tall and about five and a half feet wide, befitting a busy street scene which is not merely a street scene but an entirely metaphorical street scene. Several dozen figures—my crowd-estimating eye puts it at more like 150—populate the painting. The painting is all busy detail, like many of Bruegel’s works. The street itself is not rendered as a flat surface but is given nuance: lighter where decades of pedestrians and carts have flattened the ground, darker where it is less used; a cobblestone gutter crosses the street between two buildings in the top left quarter. The Fight Between Carnival and Lent, Pieter Bruegel, 1559 (Kunsthistorisches Museum). Click for larger size. There is a lot of sad action near that gutter: drunks and beggars, handicapped alms-seekers needing help from those who can not give any: the inebriated revelers. A few figures to the left of dead center catch the eye; a couple individuals are on crutches, one possesses useless legs and is employing short hand-crutches and a wheeled platform. (Of course my eye goes there.) Both are yelling, begging for help that does not appear to be available. Each figure’s face, if shown, is the face of an individual, a person, and not a template or a cartoon representing “face.” For much of western art history, crowd scenes were depicted with one face repeated however many times it was needed, almost like a child’s rubber stamp. Not with Breugel. These faces are caricatures, cartoon-ish, but individual. Mardi Gras is to the left, where an inn sits. Party-goers have poured out into the street and a parade is taking place, that Mardi Gras tradition that still remains in many parts of the world. A man rides a beer barrel. He is wearing a meat pie as a hat (four hundred fifty years before Lady Gaga), has knives on his belt (indicating that he is a butcher), and has a roasted pig on a spit for a mock jousting pole. Just as we read from left to right in many languages, the passage of time is often represented from left to right and so we move from Mardi Gras at the left to Lent on the right. The church sits there. In his depiction of both major buildings, the inn to the left and the church on the right side, Bruegel includes figures and faces inside the structures. The revelers in the inn are poking their heads out in the street; the churchgoers stream into and out of the church entrance. Deep inside the church one finds hints of paint indicating one more cape indicating one more figure inside. Beside the church door, Bruegel has painted a paper sign indicating the hours of different services. He has weathered it and depicted it as tattered and repaired and repeatedly affixed to the stone surface; two addenda are glued beside it. Just outside the church, alms are being given to a blind couple with begging bowls and a legless figure. The church is a part of the carnival, too: a parade float with “Lady Lent” bearing a jousting pole of a paddle with two fish on it. The figure is gaunt, the float’s followers carry bread and pretzels and pancakes. No winner is intended to be seen, as it is all a part of the Mardi Gras show; even Lent is on a float, after all. 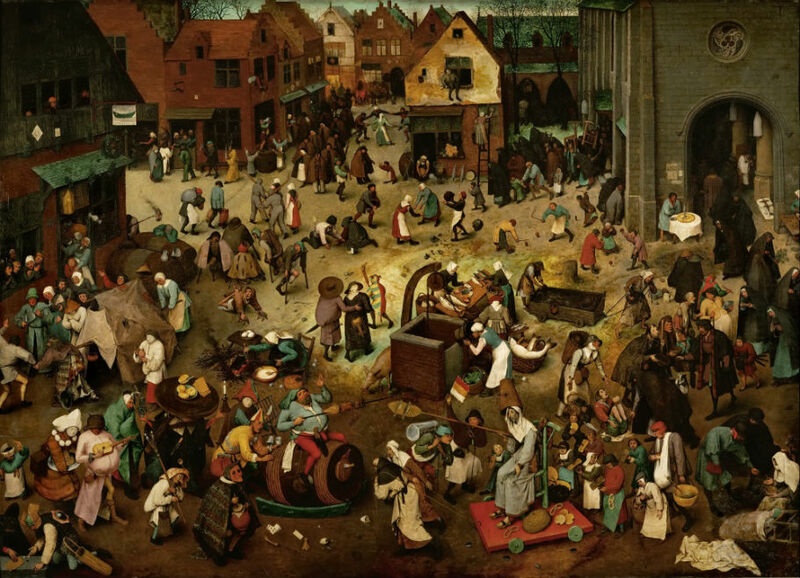 But each figure has a role to play in Bruegel’s all-inclusive street scene. Each individual is shown reacting to or participating in an action, and each piece of clothing or everyday item is a part of the history and traditions of this day at this point in history in this part of the world. But there may be an editorial comment at dead center. One group seems unattached to any part of the scene. They are shown with their backs to us and the lighter color of the street isolates them. The couple carry symbols from the era identifying them as a married pair, and they are being led by a torch-bearing figure dressed as a Fool. He appears to be heading in the direction of the inn. Like a moviegoer yelling impotently at a horror movie, people who encountered Bruegel’s painting when it was new would have wanted to yell out and prevent the married couple from disaster. Today is Mardi Gras, Shrove Tuesday, “Pancake Day,” and tomorrow certain Christians will be reminded that from dust they came and “to dust you shall return.” Thus today is for partying and cooking what stocks remain for what remains of winter, which in some years (this one) can act more like a prison than other years.